View this sample resume for a cosmetologist, or download the cosmetologist resume template in Word. Does your resume need some pampering? To be considered for top cosmetologist jobs, resume expert Kim Isaacs says it helps to have a comprehensive resume. 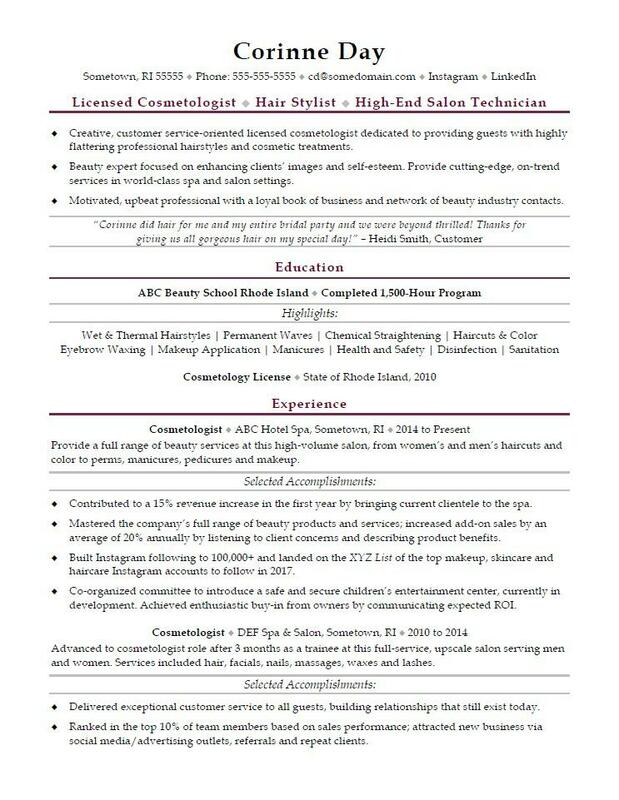 For resume writing tips, view this sample resume for a cosmetologist that Isaacs created below, or download the cosmetologist resume template in Word. Jobs for cosmetologists are projected to grow by 13% (or 87,600 jobs) from 2016 through 2026, which is faster than average, according to the Bureau of Labor Statistics (BLS). You'll find the highest level of employment for this job in the following states: California, Florida, New York, Pennsylvania, and Texas; and in the following metropolitan areas: New York City, Chicago, Minneapolis, Los Angeles, and Boston. As a cosmetologist, you can expect to earn a median wage of $24,900 per year, or $11.97 per hour, according to the BLS. Additionally, you can learn about personal service careers and search for cosmetologist jobs on Monster. Creative, customer service-oriented licensed cosmetologist dedicated to providing guests with highly flattering professional hairstyles and cosmetic treatments. Beauty expert focused on enhancing clients’ images and self-esteem. Provide cutting-edge, on-trend services in world-class spa and salon settings. Motivated, upbeat professional with a loyal book of business and network of beauty industry contacts. Provide a full range of beauty services at this high-volume salon, from women’s and men’s haircuts and color to perms, manicures, pedicures and makeup. Contributed to a 15% revenue increase in the first year by bringing current clientele to the spa. Mastered the company’s full range of beauty products and services; increased add-on sales by an average of 20% annually by listening to client concerns and describing product benefits. Built Instagram following to 100,000+ and landed on the XYZ List of the top makeup, skincare and haircare Instagram accounts to follow in 2017. Co-organized committee to introduce a safe and secure children’s entertainment center, currently in development. Achieved enthusiastic buy-in from owners by communicating expected ROI. Advanced to cosmetologist role after 3 months as a trainee at this full-service, upscale salon serving men and women. Services included hair, facials, nails, massages, waxes and lashes. Delivered exceptional customer service to all guests, building relationships that still exist today. Ranked in the top 10% of team members based on sales performance; attracted new business via social media/advertising outlets, referrals and repeat clients. A good look never goes out of style, but the opposite is also true—and that goes for your resume as much as anything. Could your resume use some extra polish? Get a free resume evaluation today from the experts at Monster's Resume Writing Service. You'll get detailed feedback in two business days, including a review of your resume's appearance and content, and a prediction of a recruiter's first impression. It's a quick and easy way to make sure you're putting your most professional face forward.